Part of my job is to mentor student nurses. This week I had a look at the recently-revised competency portfolio that the students have to bring on placement. This is a hefty document about the size of the Yellow Pages, which lists all the skills students have to learn with me, and which I need to sign off to say they’ve learned. It’s very detailed and long, with a dizzying array of competencies in it. I’d challenge anyone who thinks a nursing degree is an easy option to read through it and then say so. However, there was one thing that struck me about the competencies. They didn’t make a single use of the word “patient”. Don’t get me wrong, it isn’t that the competencies weren’t aware that nurses work with people, but they were constantly referred to as “service users” and “clients”. The word “patient” was conspicuous by its absence. Apparently nurses don’t have patients. There seems to be a view out there in mental health that “service user” and “client” are good and “patient” is bad. I don’t buy it. I’m not saying there aren’t people who don’t like being called patients, but I’ve also come across people with mental health problems who loathe being called service users or clients. Besides, anyone who’s ever been to the dentist is technically a patient. The wording on the student competencies is particularly ironic because I work in Wales. Recently the Welsh Assembly Goverment passed the Mental Health Measure, a very progressive piece of legislation that enshrines certain rights for people receiving a mental health service into Welsh law. It gives, for example, the right to have a care and treatment plan that’s formed collaboratively between patients and staff, and a right for people who’ve been in secondary care to self-refer back to services. It’s a very good piece of law aimed at putting the person using the service at its centre. Even so, the term used in Mental Health Measure documentation is “relevant patient” not client or service user. ….then that’s a much broader concept. It’s also worth pointing out that the meanings of words can be changed, often due to a conscious effort by those to whom they apply. A good example of this comes from the recent #mentalpatient furore that erupted on Twitter and into the mainstream news. 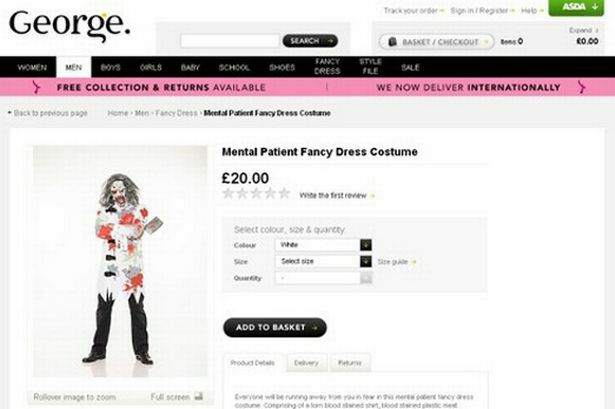 The Asda website was discovered to have a “mental patient” fancy dress costume (which Asda has since removed and apologised for) on its online store. As well as patient, client and service user, the term “expert by lived experience” has also been bandied about in mental health debates. I recently asked Twitter users what they thought of this particular wording, and got a high number of responses which I’ve Storified here. The answers varied wildly. Some loved it, some hated it, and quite a few people gave nuanced answers somewhere in between. I’m not sure that I have an opinion as to which is the “right” wording to use (and as I’ve said, I’m convinced there even is a right answer). I’d hope that whatever wording is used, people are treated with dignity, respect and in a collaborative way that upholds their rights and wishes. This entry was posted in media, mental heath and tagged lived experience, media, mental heath, patient, twitter. Bookmark the permalink. I also do not think that there is a ‘right’ word here, The range of different responses people gave you on the ‘expert by lived experience’ phrase shows how contested it all is. I also do not know how much colleagues writing the All Wales student nurse competency document will have spent deliberating on the word/s to use in this context, where the phrase ‘service user’ (it seems to me) has the most currency in mental health nurse education at the mo’. (1) For the purposes of this Part, an individual is a relevant patient if a mental health service provider is responsible for providing a secondary mental health service for the individual. (b) a mental health service provider has decided that the individual would be provided with a secondary mental health service if the individual cooperated with its provision. Hi Ben. Thanks for your reply. And yes, I agree, it’s a bit of legalese. If for ideological purposes ‘patient’ in MH terminology is being PC’d out of the way, MH ‘Service Associate’ is a damn site more acceptable and pertinent than ‘Service User’. I despise the DWP constantly calling me a “customer”. I am not a ‘customer’ rather a citizen of this country. The term customer, apart from being arrogant and misplaced, is someone who purchases things from an organisation/ company/shop. I don’t purchase things I bloody well pay for them in the first place via National Insurance. Customer also presumes a different power relationship with the ‘authorities’ – ‘customer’ is OUT OUT OUT. Client is reasonable, patient is reasonable but this emphasis on meaningless language is a mere distraction from the real issues of funding and quality practice – neither of which are up to much!!!!!!!!!!!! I agree with southsidesocialist the client service use debate is one social work and the social care sector has been having for many years. Since gaining an HNC in social care 4 years ago the word has interchanged many times. I worked in an addiction project for 3 years where the word used to describe the individuals we worked with was client. This is the word I have now became comfortable with using, but it’s not about me and my personal choice it’s about empowering the individual and treating them with the respect and dignity they deserve. In my dealings with other agencies the word used could be client or service user, we also worked closely with community mental health teams who would refer to the people they worked with as patients. This would be the cause of some conflict and resentment within our staff team as my colleagues would see this as the individual was being labelled. This is a debate that will rumble on and as I’m now studying a degree in social work and will be writing essays the debate is one I’m having internally with myself. In my opinion there is no right or wrong answer and due to the fact I have used client in the past I will continue to use this until I’m told otherwise. For me, the most important factor is that we look beyond debating these issues and concentrate our efforts on working towards empowering the individual. As a Social Work student, I wonder how many times the politically correct terminology will change in the time that I complete my studies and begin my career as a practitioner. Just as numerous terms which were socially acceptable in the past are now deemed as offensive, I have no doubts that much of the terminology used today will be viewed in the future with the same disdain. I believe that it is more important to focus our energies into delivering the best person centred service than to become caught up in a debate which will rumble on forever. This is a debate I have been having with my colleagues for the past 2 years and don’t believe there is a right word to use. The word service user and client are used regularly in social care and depending on who you speak to depends on what word is used. When I began my career in social care the word used to describe people we support was client. It’s a word I can honestly say I have never been comfortable using and I believe we should be spending more time empowering people than debating whether to label people as service users or clients. I have worked in social care for a number of years and most of the people I support do not appreciate being labelled as either. I am now studying a degree in social work and I ask myself how many times will these debates reappear? We live in a politically correct society and terms that were used freely are now deemed to be unacceptable. I am very aware that these debates will always surface and very soon language that is acceptable for now won’t be in the future. effect that this has and the dilemma that it proposes for some people. Personally, I think that ‘service user’, ‘patient’ and ‘client’ are all terms which all are used and all cause offence to various people but it entirely depends on the person themselves. To be honest I come from no great experience in social care but it is an ongoing debate that will continue to fester among both ‘service users’ and professionals. There are bigger debates within social care that pro-pose bigger problems, which is why the simple things – such as a name – tend to be forgotten and in turn the difficulty continues. For me – a social work student – the problem arises when a single word could result in work that is made to be ineffective. The word I choose creates an immediate impression. An impression that will either cause the person to open up or, conversely, close down. This results in the possibility that the ability for a social worker to empower and truly help someone is damaged and, in turn, this leads to more advanced problems. I agree with the comment made by Donna Clark. No matter which politically correct terminology is used to refer to the individuals we work with, it will undoubtedly change over time. Terminology is constantly changing, not because of the words we are using but because of the meanings and labels attached to these words. In the 1950’s the charity that worked with individuals with cerebral palsy was called The Spastics Society. The word spastic used today in reference to cerebral palsy would cause outrage, and I understand why, but the word itself is not the problem it’s the meaning and connotations associated with it, which have changed over time. Labels have been attached to certain words, which changes the original purpose of the word. Becker (1963) looks at the power that labels have and argues that labelling individuals or groups can be negative, creating and reinforcing prejudice and separation. When we label someone, we see him or her differently therefore leading to them seeing themselves differently. Therefore any terminology used has the potential to be twisted to mean something different from its original use, which means the ‘label’ we attach will have to constantly change as a result. As Donna Clark pointed out, our main concern should be on supporting and empowering the individuals we work with rather than the labels we attach in order to do so. I have worked in care for nearly 10 years and have always used the term ‘service user’ and have never came across anyone to question me why I would chose that particular terminology, until at a recent job interview. I was applying for a post as support worker at a rehabilitation unit and in the interview I was questioned as to why I referred to the person as ‘service user’ and not ‘patient’? I explained that i had always used this term as I thought this was more appropriate, especially in the environment that I was in, as the people using the facilities were not in bed sick….to me that’s what a patient is. Service provider is what I would call myself as I am providing a service required to support the service user. The condescending use of the terms “service user”, and “customer” to describe someone who is actually in need of help, irks me no end. People with mental health or other issues are not “service users”. They are not doing anyone a “favour” by availing of the said “service”. They are people with issues who need the help of society. Instead of helping someone who is sick, to realise they are sick, that they ideally need to try and work toward getting better – instead they are “empowered” and “enabled” by the system and this terminology to demand their “services” and boy do they what? The same problem exists with “benefits”, which are in fact “social welfare payments”. By phrasing it as a “benefit” or “entitlement”, you enable comfort with a position that should not ordinarily in a sane society make anyone comfortable. Unemployment benefit, housing benefit, etc. The word “benefit” just makes it sound like a perk! and “entitlement” makes it sound like a birthright. Strangely, this “birthright” does not extend to someone who might make a mere 1 thousand a year more than the next guy? It is quite offensive on several levels. That said, I admit that I also did have an issue with the word “client” until I looked it up in the oxford dictionary. While in modern english it has the connotation of the word “customer”, it does in fact originally come from a word meaning “under the protection of a patron”, so I now have a new appreciation for the meaning of using the word “client” in the context of helping someone out. I’m not entirely sure that is the reason the word has been chosen, but I suppose one word annoyance crisis has been averted!